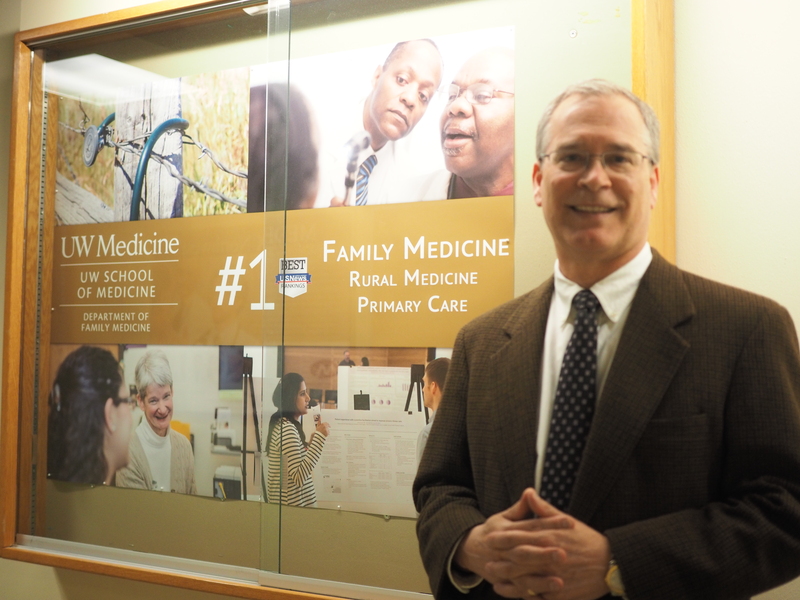 Paul James followed a calling to become a family doctor in Bethel, North Carolina. The town of roughly 1,600 in the eastern part of the state near Greenville is where his parents had a farm. After receiving a medical degree from the University of North Carolina at Chapel Hill and completing a residency in family medicine in Charlottesville, Virginia, he came home to work in the clinic where he was born. “I always knew I wanted to help people through medicine and the only doctors I knew were family doctors,” he said on what led him to medicine. As the new chair of family medicine in the UW School of Medicine, Dr. James said he is now driven to make healthcare more affordable, accessible and of higher quality. He said he was attracted to UW because of its history of excellence in rural medicine education and for being a role model for innovation. He believes the best healthcare is team-based care, which UW Medicine is poised to deliver. In an ideal healthcare system, he said, a patient would have easy access to medical care in one place and any team member could serve as a patient advocate. This is known as the medical home. For instance, a patient could see their primary care physician, who would become their advocate, whether it’s referring that patient to a physical therapist, clinical pharmacist, behavioral health specialists, nursing and physician assistants, or social worker – ideally in the same clinic. What he wants to avoid is sending patients to a specialist if they don’t need to or to have patients seek treatment in hospitals and emergency treatment centers if better care can be delivered more effectively in the patient’s medical home. This could help drive down healthcare costs. James also wants to see a fundamental shift from disease-focused care delivery models to ones that focus on patient identified health goals. He said some patients are diagnosed with diseases and prescribed medications with the thought that fighting disease leads to improved health – but really makes patients feel sicker. He also advocates for elderly patients to have a greater voice in what kind of care they receive, including where they receive it. He said better communication with elderly patients can reduce the expensive and often unhelpful intensive rescue attempts that some patients experience near the end of their life. James comes to UW after 16 years at the University of Iowa, where he was an endowed chair in rural medicine and chair of the Department of Family Medicine. He was also a professor of occupational and environmental health. At Iowa, his research focused on translating clinical evidence of cardiovascular disease into practice. He was president of the Association of Departments of Family Medicine in 2014-2015. James made the leap into academic medicine after five years of working in the Bethel clinic. “I could remain a rural family doctor and help 2,000 people or I could help train hundreds of physicians and have a bigger impact,” he said. While in North Carolina, he developed an agromedicine program by establishing linkages between the North Carolina State University Cooperative Extension System and East Carolina University School of Medicine. Then he moved to New York, where he completed a faculty fellowship in rural health at the State University of New York in Buffalo. He was the director of the Office of Rural Health and co-investigator in the federally funded New York Rural Health Research Center. In New York, he received the outstanding teaching award three times and was on the board of a program that trains EMTs how to extricate injured individuals from farm machinery and other accidents.